Hello all, it is a new month and time for a new CASE challenge at HLS. The designer this month is the talented Gloria Lee. She has this lovely card for us to CASE. 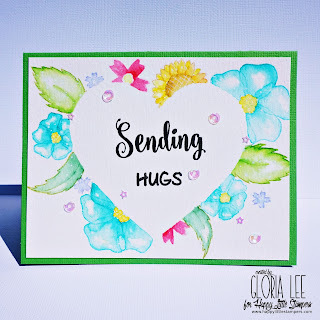 I was inspired by the masked panel, I chose a circle to mask, and then used the stamps from Paper Smooches - botanical to stamp around in some bright colors. I chose a very simple sentiment from HLS - whimsical friends to stamp in the center, and a few jewels to finish off. This one is square card. Do stop by the HLS blog to see more from the DT. I've tried square cards maybe once or twice - its so difficult to veer from the norm!! ;) I love how you've stamped those flowers with solid, prominent colors..looks great! What a pretty card Rahmat! I love the use of bold colors here. The sentiment really stands out beautifully. Love your flower stamping and intense colors! 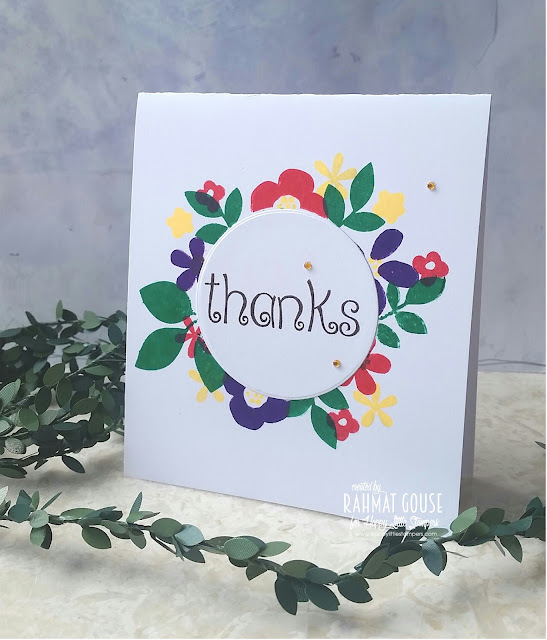 I love the pretty flowers around your circle Rahmat and the whimsical font really suits the feel of the card. Your card is so folksy with those bright blooms! You did a wonderful job casing that beauty!